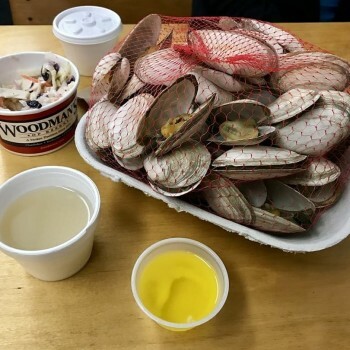 North Shore families have long celebrated their birthdays and other special occasions with a delicious seafood spread from Woodman’s of Essex. You can take the tradition of celebrating with Woodman’s to the next level by trading in your typical Thanksgiving fare for a seafood extravaganza. From the fried clams that made Woodman’s famous in 1916 to an All-American clambake with a side of “chowdah”, you have many amazing menu choices to consider in planning your new Thanksgiving dinner traditions. For decades upon decades, turkey, stuffing, mashed potatoes, gravy, yams, green beans and cranberry sauce have dominated the Thanksgiving table. Although there is nothing wrong with these traditional holiday foods, sometimes it’s nice to jazz it up for yourself and your guests. You can turn the tables on tradition by electing to make seafood part of all your Thanksgiving celebrations, now and in the future. With your decision to trade in your traditional Thanksgiving fare for a seafood spread, you can also elect to have the full-service catering team at Woodman’s handle your menu. Here are just a few of the catering menu items you can consider for your holiday meal. Perhaps nothing is more exciting than trading in your turkey for a classic clambake. The mouthwatering flavor of the steamed clams and mussels pair beautifully with clam broth and garlic and wine sauce. Hot boiled lobster in a drawn butter and lemon sauce rounds out the seafood fare, while slow-cooked baby back ribs offer a thrilling flavor contrast. Clam chowder, corn on the cob, corn bread and coleslaw add a depth of flavor to this amazing meal. Despite the name, you can elect to fill your barbecue menu with coveted seafood selections. Begin your meal with the gluten-free, house-made clam chowder that has won awards for its amazing taste. For your main course, enjoy the poached salmon filet alongside the shrimp and scallop seafood kabobs. You have your selection of sides, ranging from corn bread and baked rolls to New England baked beans and grilled vegetables. Fried clams started it all at Woodman’s, so it is only right that these delicious little treats jumpstart your new Thanksgiving traditions as well. The P revolves around “Chubby’s” Original Fried Clams that come with a homemade gluten-free tartar sauce. With lobster rolls as the main entrée, your seafood menu will surely delight you and your holiday guests. Homemade potato chips, pickles and corn on the cob pair wonderfully with the fried clams and lobster rolls. The tomato, cucumber and feta salad adds contrasting flavor profiles that complete this delicious meal. If you cannot fully leave the land behind, surf and turf is a great option for your Thanksgiving meal. With this land and sea menu, you will kick off your meal with award-winning clam chowder and Caesar salad. The 1 ¼ pound lobsters and marinated steak tips will attempt to steal the show, but the roasted red bliss potatoes, sweet corn on the cob and freshly baked rolls can definitely hold their own. As with all of the catering menu choices at Woodman’s, you can then finish up your meal with a seasonal homemade dessert of your choice, such as pies, cookies, brownies or even a sundae bar. Ready to change up your Thanksgiving this year? Contact us at Woodman’s. We will help you determine the best catering menu type and size for your Thanksgiving festivities and assist in establishing your new holiday traditions. We welcome you to explore our year-round full-service catering menu to learn more about our dishes and meals before giving us a call at 800-649-1773.